The population in the Lorenz curve is represented as households and plotted on the x axis from 0% to 100%. The income is plotted on the y axis and is also from 0% to 100%. For example, a Lorenz curve can show that the bottom 50% of households bring in 35% of a country's income. The Lorenz Curve model was developed by economist Max Lorenz in 1905. How the Lorenz curve is constructed? To build the Lorenz curve, all the elements of a distribution must be ordered from the most important to the least important. Then, each element is plotted according to their cumulative percentage of X and Y, X being the cumulative percentage of elements and Y being their cumulative importance. For instance, out of a distribution of 10 elements (N), the first element would represent 10% of X and whatever percentage of Y it represents (this percentage must be the highest in the distribution). The second element would cumulatively represent 20% of X (its 10% plus the 10% of the first element) and its percentage of Y plus the percentage of Y of the first element. If income distribution were perfectly equal, 20% of households would generate 20% of income, 50% of households would generate 50% of income, 72% of households would generate 72% of income, and so on. This situation where each element has an equal value in its shares of X and Y, that is a linear relationship, is called the perfect equality line, and would be equal to the Lorenz curve. The perfect inequality line represents a distribution where one element has the total cumulative percentage of Y while the others have none. For instance, in a distribution of 20 elements, if there is perfect equality, the 10th element would have a cumulative percentage of 50% for X and Y. The perfect equality line forms an angle of 45 degrees with a slope of 100/N. The Gini coefficient is another way to measure equity and is derived from the Lorenz curve. 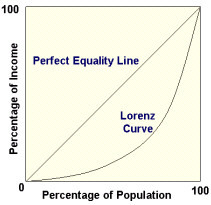 If the area between the line of perfect equality and Lorenz curve is A, and the area under the Lorenz curve is B, then the Gini coefficient is A/(A + B). The amount of inequality may be misleading. If richer households are able to use their incomes more efficiently than lower income households, the amount of inequality could be understated. When comparing two Lorenz curves, it is not possible to determine which distribution has more inequality if the two curves intersect. not considered when analyzing inequality using a Lorenz curve. Lorenz curve ignores life cycle effects. What is Robin Hood Index and how it relates to the Lorenz curve? You can find that on the page with the Robin Hood Index.